Superstar Rajinikanth's wish to become a grand dad to the kids of his younger daughter Soundarya Ashwin is going to be fulfilled soon, as the Kochadaiiyaan director is on her family way. Yes, Soundarya Rajinikanth who is leading Eros International production house in South is reportedly pregnant. She made her directorial debut with 'Kochadaiyaan' in 2014, which was India's first motion capture film and it had Rajinikanth in the lead role. It is to be noted that during the audio launch of 'Kochadiiyaan', Rajiniknath in his speech asked Soundarya to take care of her family first and then focus on her career. The daughter has fulfilled her dad's dreams. Soundarya Rajinikanth is now serving as the Creative Project Director and Head of the Digital Initiatives in Eros International. Thalaivar already has two grandsons Linga and Yatra, sons of Aishwarya-Dhanush and the third one is on board. 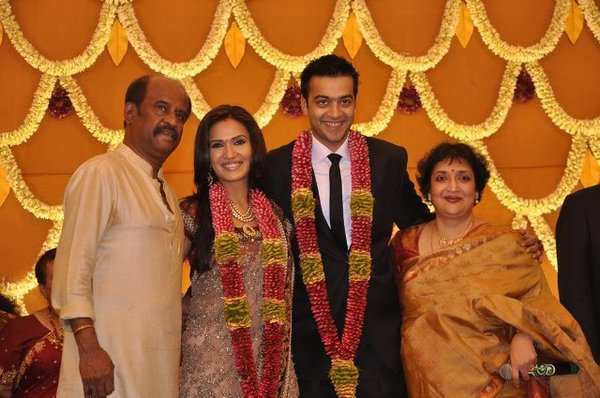 Congrats to the couple Soundarya-Ashwin and extended happiness to Rajinikanth and family.